The Indian subcontinent is endowed with the most varied geographical divisions and climatic variations. Naturally, the diverse landscape and climatic conditions serve as natural habitats to a vast variety of flora and fauna. 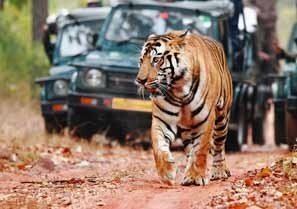 Numerous Wildlife Sanctuaries and National Parks have been established all over India with the objective of securing the future of endangered species of flora and fauna by conserving them in their natural environments. 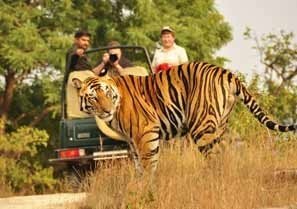 Indianholiday provides you detailed information on the Top 10 Wildlife Destinations in India, so that your Wildlife Tour to India remains a most memorable one. 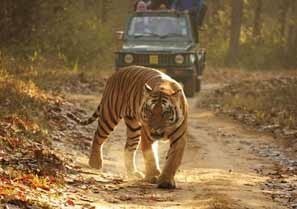 Scattered all over the country, the Top 10 Wildlife Destinations in India offer an enormous range of habitats - extending from the majestic Himalayan peaks in the northern India, through forests, lakes and deserts, to the moist Nilgiri hills in the south, where the coastline is lapped by warm waters of the Indian Ocean. These parks and reserves occupy a place of pride among the wildlife sanctuaries in India. 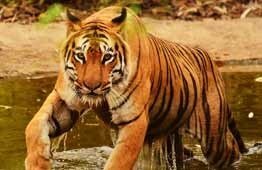 Located within the Vindhya Range, the Bandhavgarh National Park is touted for housing the highest density of tiger population in India. The best view of tigers is guaranteed. 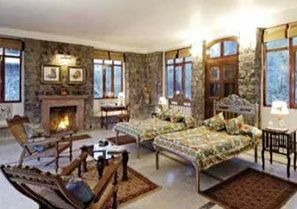 The Corbett National Park is situated in the foothills of the Himalayas and is spread over the districts of Nainital and Garhwal in the State of uttarakhand, located in northern India. 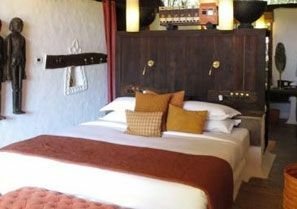 Ranthambore National Park is positioned at the convergence of the Vindhyan plateau and Aravali hill, in the Eastern region of Rajasthan. Two rivers, namely Banas in the North and Chambal in the South, flow through this National Park. The road to Sunderbans National Park is not dusty; rather it is moist and saline because it is located in the World's largest Delta formed by the mighty Ganges and Brahmaputra. 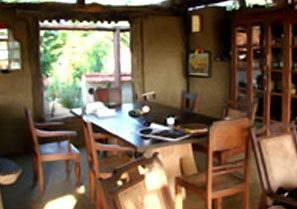 Renowned for its splendid Mangrove Forest, where one may discover the elegant Sundari trees, one of the Mangrove Variety. 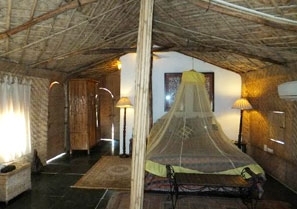 Gir National Park in Sasangir, Gujarat is a beautiful park dotted with an abundance of flora and fauna. 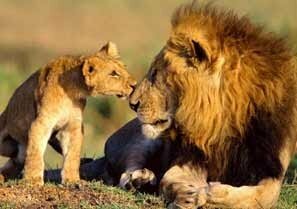 Sprawling over an area of 1412 sq km, Gir National Park is one of the most charming National Parks in India. 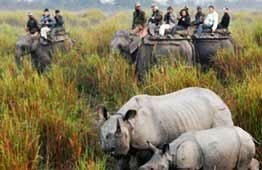 A prominent wildlife attraction in India, Kaziranga National Park is a place where you can study the features and explore the territory of One Horned Rhinoceros. 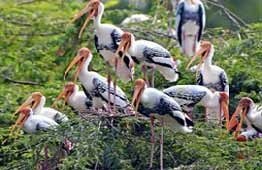 Keoladeo Ghana National Park or Bharatpur Bird Sanctuary as it is more commonly known as, is a wonder of the natural world as the Taj Mahal is to the human world. 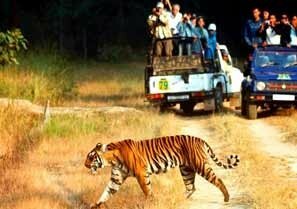 Kanha National Park is one of the world famous tiger reserves located in Madhya Pradesh in the districts of Balaghat and Mandla. 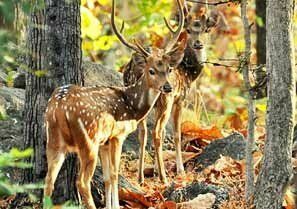 The word 'Kanha' has been derived from the 'Kankar' which is used to refer the clayey soil of the valley. 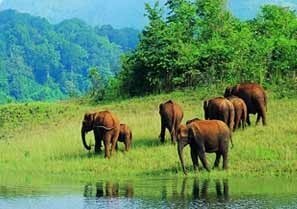 305-sq-kms Set high amid the lofty ranges of the majestic Western Ghats, in God's Own Country Kerala, is the Periyar Wildlife Sanctuary and Tiger Reserve.